Fullfilles all requirements of EU-regulation 98-24; binding of hazardous respirable dust. 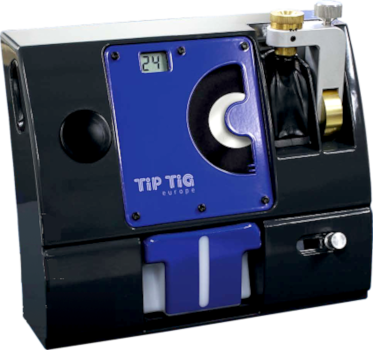 The TIP Trimmer is the first sharpening device, that can handle both sharpen and trimming of tungsten electrodes. Safety first: The hazardous, respirable dust is collected in an easy replaceable, sealed container. No extraction unit required. Sharp as sharp can: Wet grinding is always the best way to sharpen a tungsten electrode. 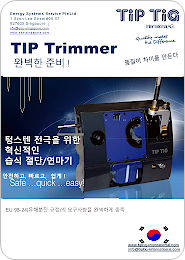 The grinding angle is continuously adjustable and is digitally displayed. Repetitious process with perfect result! 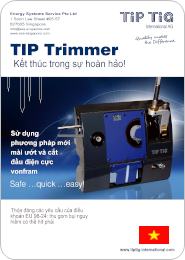 High life: Lateral off-set of the electrode guidance allows triple usage of the diamond grinding disc. 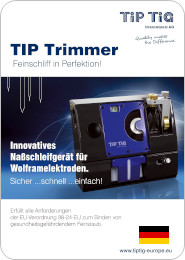 Up to 10.000 sharpening cycles are possible. High lifetime = lower costs! 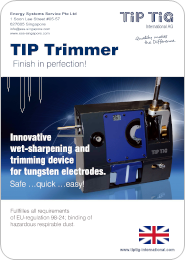 Size matters: With the TIP TRIMMER you can trim your tungsten electrodes at will, down to a minimum length of 1 0 mm. With the right accessories you can handle electrode diameters from 1,0 mm to 8,0 mm.